Pro-Trump and anti-Trump protesters clashed this afternoon in Center City Philadelphia. It began around 1 pm. A permitted pro-Trump rally was held on Independence Mall with plans to march down Market Street and then to Eakins Oval as part of a national Make America Great Again March. 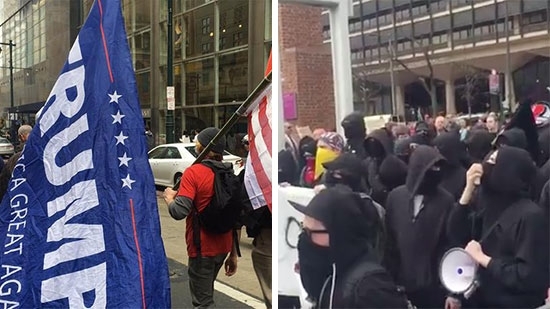 An anti-Trump Antifa protest group began to make their way through the city with plans to meet and stop the pro-Trump rally. Police advised the Trump group not to march due to safety concerns, as the counter protesters encircled Independence Mall. Eventually, they were allowed to march but only made it to City Hall and then turned around. Meanwhile, a large group of anti-Trump protestors dressed in all black caused havoc in Center City, at times engaging with police. They dispersed some time after 3 pm. See video below. A missing 6-year-old boy from the Cobbs Creek section of Philadelphia has been found safe. Trevor Montgomery was last seen 9:30 p.m. Friday night when his he was put to bed in his home on the 700 block of Ithan Street. When his family went to get him this morning at 8 a.m., Trevor was not there. After a search, he was found safe around 1 p.m. Saturday. No details about his disappearance for discovery have been released. A 38-year-old woman is in critical condition after being hit by a car in Drexel Hill, Delaware County this morning. It happened around 8 a.m. Saturday along State Road near Harper Avenue. The woman was out for a morning run when she was struck by an 88-year-old man on his way to church. He was driving a 2001 Toyota Camry. The man did stop and is cooperating. The woman was trapped under the vehicle and emergency responders were able to lift it to pull her out. She is now at Lankenau Medical Center. Upper Darby Police Superintendent Michael Chitwood said. "Right now, it's just a tragic accident."